Author: Flavien Gbéto. Series edited by: Wilhelm J.G. Möhlig, Bernd Heine. Fon is a group of dialects which is part of the Gbe languages of Benin. It is mainly spoken in the coastal area, and, as a lingua franca, expands gradually into the northern parts of Benin. Nowadays Fon ist one of the major languages used by 40-50% of the inhabitants – that means an amount to about 1.7 million people – as native, secondary or vehicular language. Also outside of Benin it is an important lingua franca in Westafrica and is spoken in Southwestern Nigeria, but also widespread in Côte d'Ivoire, Burkina Faso, Niger and Togo. 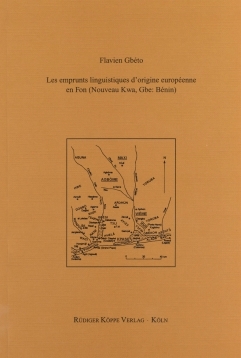 The study deals with lexical innovations of European origin in Fon. Firstly, it contrasts European phonemes with their counterparts in Fon, and then analyses the specific integration of loan words of Portuguese, French and English origin into the phonological structure of Fon. Following the analysis of the phonemic integration of these loan words, the author enlarges on the prosodological aspects of this process. The following chapters deal with the phenomenon of syllabic assimilation, first names in Fon of European origin and the integration of French verbs and verbal expressions into Fon. The book is based on the author’s intensive fieldwork collection of data over the course of 16 years which in its systemacy and minuteness of detail differs from publications so far. [...] the book presents an interesting set of data in an interesting way, and is well worth consulting by anyone interested in the phonological representation of imported lexicon.